Mývatn is a lake in the northeast part of Iceland and one of the largest lakes in the country approximately 36 square kilometers. The lake is not deep, and the deepest part is only four and a half meter. It is and has been for a long time, one of the main tourist attractions in the country renowned for its beautiful small islands, exceptional shore, exceptional flora, and abundant birdlife. The area has a dreamlike and mysterious quality and was created by a large basaltic lava eruption 2300 years ago. Dominating the surrounding landscape are volcanic landforms, like lava pillars and pseudo-craters, Dimmuborgir lava being the best known. The area surrounding the lake lies on the western border of the volcanic zone cutting across Northeast Iceland and is an extension of the Mid-Atlantic Ridge. It is still active; indeed the Krafla volcano is located in the neighborhood. A volcano that was very active only a few decades ago when series of eruptions created some serious concerns in a nine-year period between 1975 to 1984. Many of the islands on the lake have one or more craters. And most of the mountains in the lake's vicinity were formed by eruptions under ice during the Ice Age glacial period. Like many similar places in Iceland, it is a geological wonderland with fascinating stories to those who can read the landscape. Lake Mývatn and its surrounding wetlands have an exceptionally rich fauna of waterbirds. Indeed, it is a birdwatcher's paradise. Apart from thirteen types of ducks, you will find the Slavonian grebe, red-necked phalarope, great northern diver, red-throated diver and the whooper swan. Occasionally it is possible to see the gyrfalcon, the Icelandic Falcon. The locals around Lake Mývatn have a long tradition of harvesting duck eggs for domestic use. To ensure sustainability, the collection follows strict age-old rules of leaving at least four eggs in each nest for the duck to incubate. Maybe one of the most amazing aspects of the Lake Mývatn area is how mindful the locals have always been of its delicate beauty. It is not the easiest places to cultivate and live on as the altitude is almost 300 meters. Their respect is apparent everywhere you go and inhabitants have fought serious battles to protect their nature, even blowing up dams with dynamite, which is almost unheard of in peaceful little Iceland. Myvatn is one of the fascinating places to stay if you want to explore the north east and all its magnificent natural wonders. 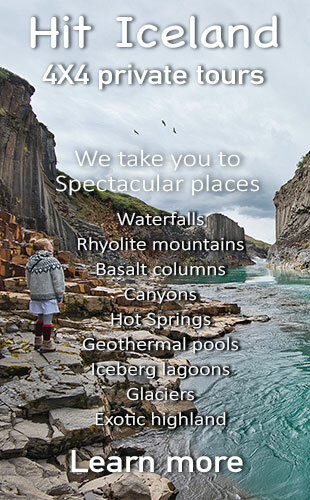 You can visit waterfalls like Dettifoss, Goðafoss, and Aldeyjarfoss or the hot spring area at Námaskarð or go whale watching in Húsavík It is also a good choice if you want to take day tours into the mysterious highland and visit Askja and Herðubreið. The area offers good campgrounds and good accommodation with fine restaurants and many exciting activities. It is a good place to stop when on a family vacation and explore the nearby natural wonders and take some excellent hiking tours.